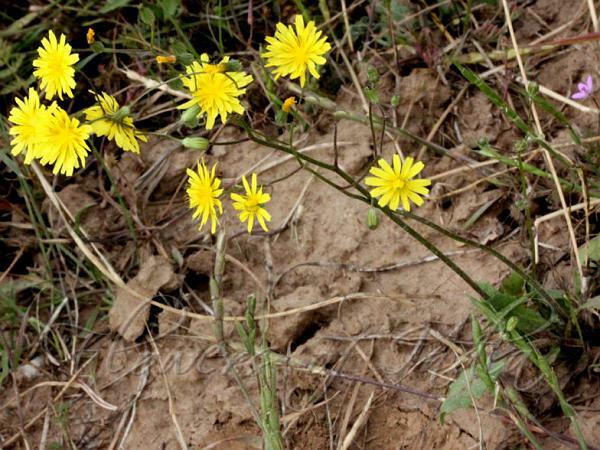 Sacred Hawksbeard is an annual herb 3-55 cm tall. Flowering stems are scapelike, erect or spreading-erect, sulcate, hairless or glandular, unbranched with a single head or branched near top. Leaves are at the base in a rosette, entire or toothed. Flower-heads are yellow with numerous yellow ray-florets, 15-20 mm across, florets 5-toothed. Inner involucre bracts are 8-10, linear, pubescent, 8-10 mm long, with hyaline margin, erect, outer few, small, spreading. Achenes are linear, narrowed at both ends, reddish when mature, without beak, 3-5 mm long; pappus of simple hairs, soft, white, nearly as long as achene body. 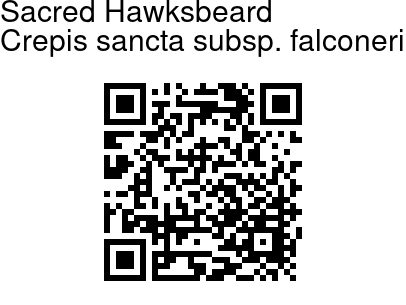 Sacred Hawksbeard is native to Europe, naturalized widely. It is now found in E. Europe, W. Asia eastwards in the Himalayas up to Nepal. Identification credit: Gurcharan Singh, Nongthombam Ullysess Photographed in Kashmir & Lahaul, HP.